H.H. Indradyumna Swami appeared in this world on May 20th, 1949 in Palo-Alto (California, USA). Leaving aside his university studies at an early age, Indradyumna Swami devoted himself to the search for spiritual knowledge. He finally reached his goal in 1970, when he discovered the International Society for Krishna Consciousness in Detroit, Michigan. After several months of associating with devotees, he joined the temple on East Jefferson near the center of the city. Within a week of joining, he began participating in and even leading harinam (congregational chanting of the Lord’s Holy Names) and book distribution parties. That same year, Indradyumna Swami met his eternal spiritual master, His Divine Grace A.C. Bhaktivedanta Swami Prabhupada, Founder-Acarya of the International Society for Krsna Consciousness, and received both harinam and brahminical initiation from him. 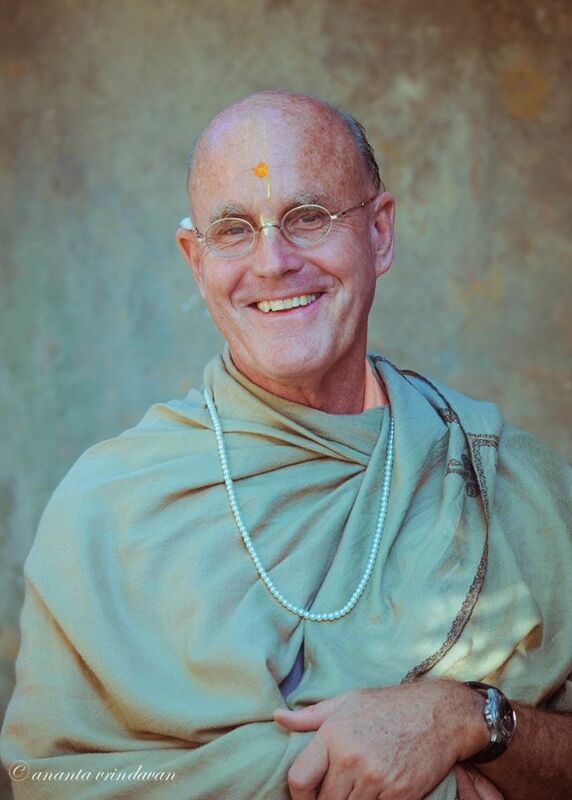 Following the instruction of his spiritual master to “preach boldy and have faith in the holy names,” Indradyumna Swami left the USA in 1971 (only a year after joining) and headed for Europe where he would assist devotees in opening new centers. Srila Prabhupada’s desire was that noble and educated men should dedicate there lives to spreading Krishna consciousness all over the world. In order to fulfill this desire of his spiritual master, Indradyumna Swami took sanyassa (renounced order of life) in 1979, at the age of 29. In 1983, he served as temple president for a few years at the New Mayapur Project in France. Since 1986, Indradyumna Swami has been traveling and spreading the message of Krishna Consciousness throughout the world in countries such as the USA, Poland, South Africa, Australia, New Zealand, Hungary, Ukraine, Russia and South America. He is well-known as one of ISKCON’s most active preachers. A shining example of his large-scale preaching is the traveling Festival of India tour which he organizes every year in Poland. These festivals attract thousands of people, who learn about and relish the nectar of Krsna Consciousness through music, dance, drama, spiritual discussion, and prasadam (food that is first offered to the Lord). Since 1995, Indradyumna Swami has been writing his Diary of a Traveling Preacher, which describes many of his adventures and realizations while continuously traveling. The following autobiographical essay, “Shelter Beyond Duality,” was published in the 1993 edition of ISKCON’s Back to Godhead Magazine. This is the story of my life. Or better yet, the story of two lives: the one my spiritual master saved me from, and the one he gave me. Both concern the same person, but one life was temporary, ignorant, and full of suffering, and the other is eternal and full of knowledge and bliss. This is the story of the miracle, for me at least, of how I was delivered from the ocean of material life. You could say my story begins within the womb. But I know it goes back many lifetimes, to a past too distant for me to know or understand. If cameras had existed that long ago, I imagine we’d see on these pages photos of kings and paupers, animals and men, the famous and the infamous — all dying and then being born again. But this chapter of my story begins, like all life stories, from the day I was delivered anew, with a mother and father, sisters and brothers, cousins and nephews. But after some months the medicines proved effective. I left the hospital a little wiser. I was only four, but I knew more what to expect. Life wasn’t going to be all what the storybooks said. As I grew, I mostly learned how to survive. School seemed irrelevant. I became disillusioned quickly, my mind pondering the dualities of birth and death, happiness and distress. Nothing would last. That I had seen—not the shelter of the womb, Old Yellar, or for that matter even me. I began to see that others were also perplexed and suffering. Not only people, but animals as well. But not everyone was sympathetic to how I looked at things. At twelve years old in school we were asked to draw what we’d like to see on the table at the upcoming Thanksgiving Feast. I drew vegetables, no turkey or meat. My classmates saw it as hilarious; my teachers thought it odd. And the day I refused to eat meat my father figured I was downright impolite, and he sent me to bed without supper. As I lay in bed, I thought how hard life is, even if you try to do things right. At sixteen I made the break. “Maybe it isn’t like this everywhere,” I thought. Perhaps somewhere else I could find a really satisfying life. Sometimes I’d felt I’d come close, especially when my friends and I surfed the waves at Stinson Beach, near San Francisco. Out there, we were free and moving. At San Blas we were thrilled when we caught waves that gave rides a mile long. But the real challenge was around the point, at Rodger’s Bay. There the waves broke in perfect formation. The curl was flawless—you could shoot the tube! It seemed perfect. But there was one problem—the waves broke onto a coral reef. I don’t really know what impelled me to paddle toward the reef that day. Some boys challenged me; others pleaded with me not to go. Perhaps I was desperate. I caught the wave with ease. It was big, beautiful, and long. I quickly turned left, crouched, and suddenly found myself racing into the tube. I was thrilled, exhilarated—this was it! But in my excitement I lost my concentration and slipped… right into the deadly reef. I rolled and tumbled across the rocks and landed close to the beach. Some villagers came and pulled me out. I was fortunate; except for a large gash on my left leg, I had mostly minor cuts and bruises. But my surfboard was finished, and so was my search for the perfect wave. Back in the States, I reflected that if I couldn’t save myself, maybe I could save others. So I enlisted in the Marine Corps, America’s top fighting unit. My country was fighting in Vietnam to stop the spread of communism. I thought if we could win in Vietnam, perhaps we could bring peace and happiness to the world. I looked around for someone to explain the painting in more depth. But a guard announced that the museum was about to close. Disappointed, I walked out the main entrance and came upon a most amazing sight. Seated on the lawn before me were orange-robed monks with large staffs in their hands. They were speaking intently to a crowd around them. Krsna is the Supreme Personality of Godhead. He lives forever in the spiritual world, beyond the dualities of material life. His transcendental land of Vrndavana is populated by goddesses of fortune, who appear as milkmaids and who love Krsna beyond anything else. The trees there fulfill all desires, and the waters of immortality flow through land made of wish-fulfilling stone. There all speech is song, all walking is dancing, and the flute is the Lord’s constant companion. Cows flood the land with abundant milk, and everything is luminous like the sun. Since every moment in Vrndavana is spent in loving Krsna, there is no past or future. “That’s it!” I yelled out. Surprised, the monk turned toward me. “That’s what?” he asked. “He’s probably on LSD,” remarked a woman to my left. I composed myself, a bit embarrassed that the entire crowd was staring at me. But I was determined. Never before had I heard such knowledge, and so concisely explained. I introduced myself to the monk. And so it began—this new life, my life as a devotee of Krsna-way back in 1971. If I could show you all that’s happened since then, you’d see many photos on this page—of singing the holy names and dancing, of feasts and illuminating discourses too numerous to mention or explain. Let it suffice to say that on that day I started home again, beyond the dualities of birth and death, to the shelter of the eternal realm.